Description: This is a small nudibranch, with adults only growing to about 12mm. The body is translucent white, with scattered brown or green pigment on the back and cerata. The cerata have 2-3 rows of tubercles. The tip of each ceras is covered by a pale patch and encircled by a brown-coloured ring. The rhinophoral and oral tentacles are smooth, the tips of these tentacles are white with a sub-terminal brown band. 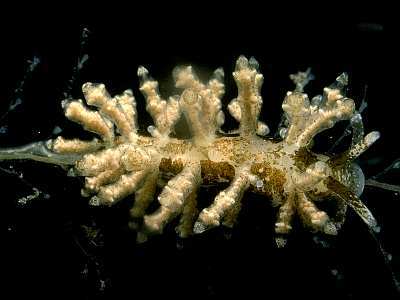 Habitat: This species feeds on the plumularian hydroid Kirchenpaueria similis which is like a smaller, finer version of Kirchenpaueria pinnata. The spawn is similar to Eubranchus vittatus. Distribution: Few records exist for this species, however it has been found around the southern and western coasts of the British Isles, Lundy Island and Pagham Harbour, Sussex, north to Mulroy Bay, Co. Donegal and St Kilda, off the west coast of Scotland. Similar Species: Eubranchus doriae is sometimes confused with Eubranchus vittatus but may be readily distinguished by the presence of tubercles on the cerata. Cerata with irregular swellings over outgrowths of digestive gland. Picton, B.E. & Morrow, C.C. (2016). Eubranchus doriae (Trinchese, 1874). [In] Encyclopedia of Marine Life of Britain and Ireland.